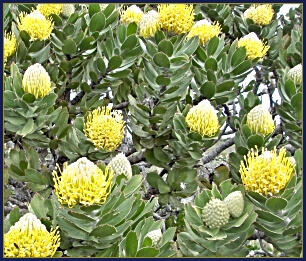 The Fynbos Biome is the name given to the indigenous vegetation that puts the "garden" into the Garden Route. The wonderful diversity and vastness of species attributed to fynbos is the result of its antiquity. The southern hemisphere did not experience the last ice age of 10,000 years ago that smothered and wiped out the vegetation of the northern hemisphere. 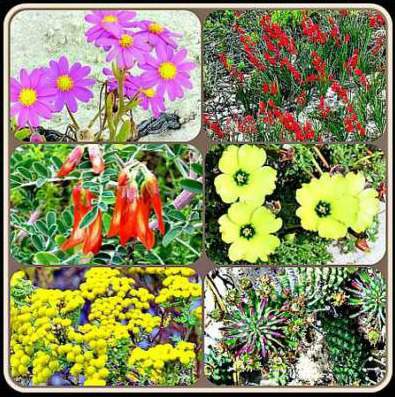 Although the biome occupies a mere .04% at the southern tip of Africa in a tiny crescent of the Western Cape, it boasts of at least 45000 different plants, over 69% of which are endemic to the region and found nowhere else on earth. The European botanists that landed in the Cape in the 18th and 19th centuries were astounded by the variety of new species they encountered at every step. For example, between 1772-1795 Francis Masson, a Scot from Kew Gardens, discovered 400 species of plants that were new to science, some 50 of which were Pelargoniums that soon became popular horticultural subjects in Europe long before their beauty was appreciated in South Africa. The Englishman William Burchell (1781-1863) recorded 105 species in a short walk around the Lion’s Head of Table Mountain. Over the next years he collected over 60,000 plant specimens. Dr Rudolf Marloth, a German analytical chemist coined the term Cape Floral Kingdom that christened the region botanically. His expeditions into the mountains to examine and obtain samples of the flora led to his involvement in establishing the Mountain Club of South Africa in 1891. 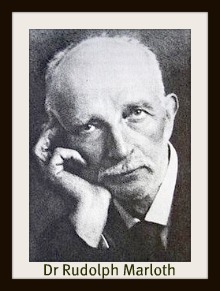 He found many new species on his field trips that he included in his magnus opus, six volumes of “The Flora of South Africa” published between 1913 and 1932. The Cape Floral Kingdom is the smallest of 6 Floral Kingdoms in the world and is entirely within one country. It occupies 6% of the land area of South Africa and yet one third of all plant species are found here. It contains more plant species in a 10 km radius than tropical forests that are generally recognised to contain the highest biodiversity anywhere in the world. It has such a wide range of shrub shapes and distinctive floral forms that it has proved to be richer than the plant life of the whole British Isles. However, many of the species recorded by the early naturalists are now extinct. 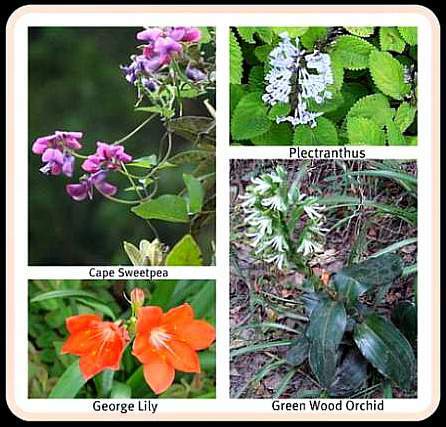 Many plants that are popular worldwide today had their origins in the fynbos biome. Flowers such as Pelargoniums, Fressias, Sparaxis, Ixias, Gazanias, Gladioli, Irises, Watsonias, Tritonias, some orchids and numerous lilies have gained world-wide acclaim. 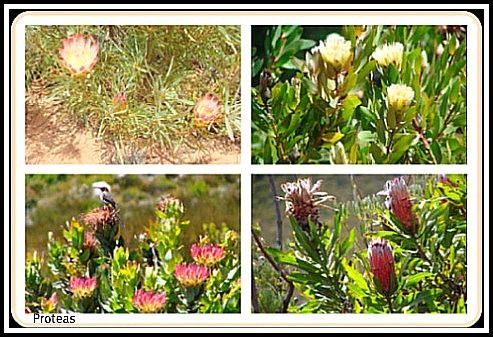 The Fynbos biome is made up of 2 vegetation types. 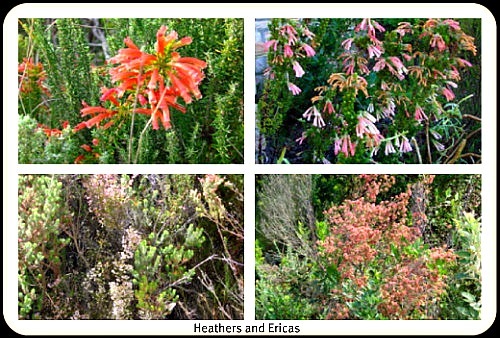 Many fynbos species are typically confined to acidic, nutrient-poor sandstone soils. 5000 species are not found anywhere else in the world, many are rare and some 1700 species exist on the edge of extinction. 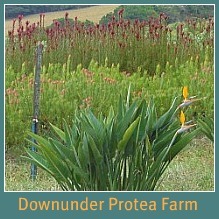 In contrast, Renosterveld soils are fertile so much of this ground has become farmland. Destruction of their habitat through agriculture is eating into these unique floral reserves. 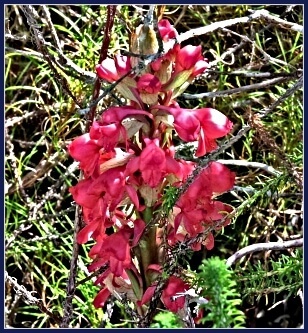 Road verges are turning into fynbos preserves of the flora that used to grow on the other side of agricultural fences. 2. 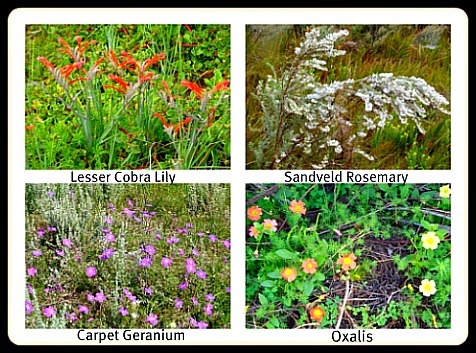 Renosterveld has 1500 plant species divided up as follows. The Red Data Book that classifies rare and endangered plants records that the fynbos biome has the highest number of listed plants in it in the world. 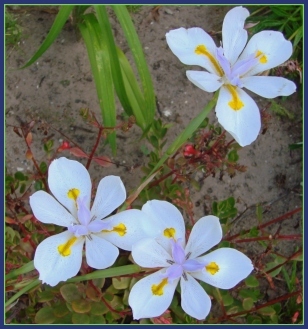 Three quarters of all plants in the South African Red Data Book occur in the Cape Floral Kingdom. Colonisation of the Cape and growing European settlement gradually transformed fynbos country into vast farmlands of wheat, barley, oats, canola, fruit trees, vineyards and livestock pastures for sheep and cattle. Today a fraction of the Renosterveld type of fynbos remains. Meanwhile, long before people were appreciative of their environmental value, many lowland species had been lost due to far reaching urban expansion. Ill-considered holiday resorts, residential developments and golf courses have continued to encroach upon endemic coastal dune types and sandveld fynbos. Commercial pine plantations have disturbed and overrun many areas of mountain fynbos. It took a long time for people to realise that nature needed to be protected from the epidemic spread of humanity and to find the will to take necessary action to introduce conservation measures. On the other hand, botanists, hikers and keen horticultural people are discovering from time to time, new plants in remote valleys and areas otherwise difficult to access. These rarities capture our imagination and allow us to marvel at the extent of the unbounded diversity the fynbos biome has produced. Many species however, only have a tiny range which increases their vulnerability to extinction. 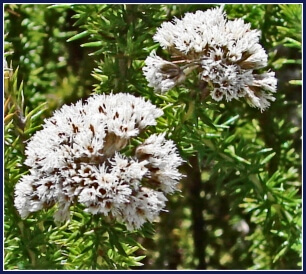 For example, Gordon’s Bay Pincushion is found in a small area on rocky, west-facing, sandstone slopes of the mountains above Clarence Drive, between Gordon’s Bay and Kogel Bay, overlooking False Bay. The Bot River Sugarbush is found on a relatively narrow zone along the southwestern Cape coast that extends through Kleinmond, Houw Hoek, Hermanus, Elim, Napier and Bredasdorp to Struisbaai. World-wide alien plants have proved to be problematical in that they become overwhelmingly invasive. In the fynbos biome, Port Jackson, Silky Hakea, and Black Wattle are chief amongst those invasive plants infesting tracts of otherwise undisturbed mountains and valleys. Black Wattle grows into impenetrable thickets eating into the indigenous vegetation and is a major cause of damaging wildfires although fire is an essential component of fynbos survival. 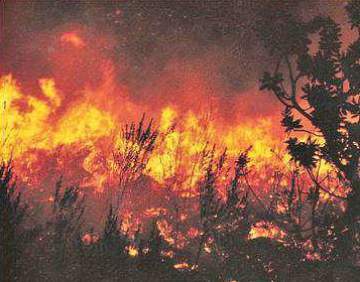 An integral feature of the fynbos biome is fire and it is an essential component of its perpetuation. There are five recognised fire climate zones, the frequency and intensity varying from one type of vegetation to another. Research has shown though that fynbos areas should not be burned more frequently than 7 -12 years but lightning strikes are happening more often resulting in veld fires. This could have an adverse effect on endangered fynbos species that take several years before they reproduce. Spontaneous burning usually occurs in the heat of late summer. The heat combined with “berg” winds ignite the veld and fire burns rapidly through an area. 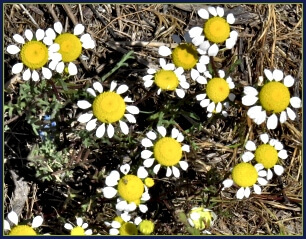 Regeneration of fynbos is enabled as the aftermath of the burn by encouraging the germination of fynbos seeds. 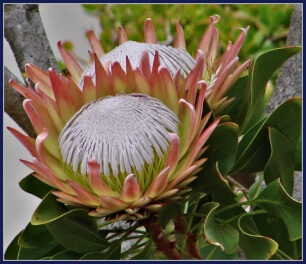 Proteas, for example, are not long-lived plants, and the regeneration of their seed by fire ensures their survival. 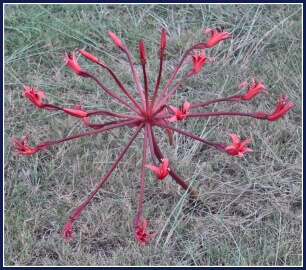 In other instances burning is a prerequisite for sprouting and flowering, for example, the Cyrtanthus Fire lily. On the other hand if fire happens too often, plants may not be mature enough to generate seed dispersal and this could mean the extinction of a species. Climate change is being recognised as real threat to the fynbos biome. Classified as having a Mediterranean type climate, the Garden Route region has been experiencing seriously reduced rainfall since 2008. Some perennial rivers have stopped running and the whole area has encountered hotter summer conditions. We are presently living in what's called by many local municipalities, "a water stressed area". This has to be affecting our natural environment which has adapted to having varying amounts of rainfall almost every month throughout the year. Elsewhere in the Cape Floral region, rainfall has been irregular, less winter rainfall and more summer rain, or longer periods without rain and then excessive rainfall leading to flooding. 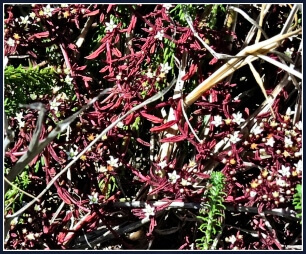 When walking in the fynbos biome, I am enthralled by the diversity of plants one can see in an area of less than a meter. One can but marvel at the miracle of nature – how such beautiful flowers, tended by no-one, can flourish in these poor quality soils. 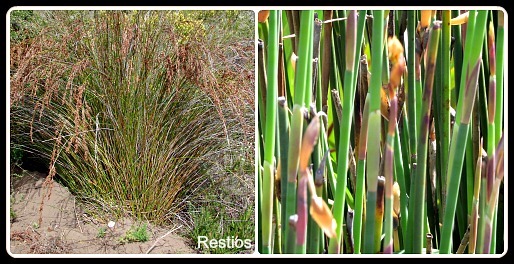 The many kinds of restios, a group of reed-like grasses should not be overlooked. Stunning in nature, in a fynbos garden they are a fine backdrop to their floral counterparts and are also excellent accent plants. I used to be ignorant of matters concerning ecology and preservation of our natural environment. As the years went by and I read more, I realised how important planting indigenous was for the biodiversity, integrity and sustainability of specific vegetation biomes. As John Keats’ poem says “A thing of beauty is a joy forever” and the fynbos biome is a bountiful wild garden of breathtaking variety that deserves to be protected. To nurture it in nature we just need to recognise its intrinsic value in our lives. More areas need to be proclaimed for its preservation. Considering that 45000 plants are represented in the fynbos biome, that’s plenty of reasons to grow some of the beauties in our gardens. 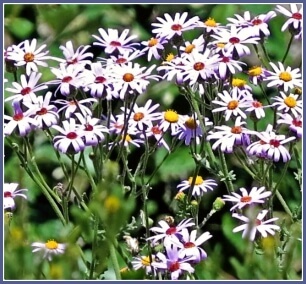 It's far better to grow endangered fynbos and thereby helping to ensure it's survival as opposed to exotics (plants that originate from other countries). These spectacular plants, keenly sought-after by other countries, are right on our own doorstep. The much loved and venerated Kirstenbosch National Botanical Garden situated on the slopes of Table Mountain is termed the most beautiful garden in Africa. 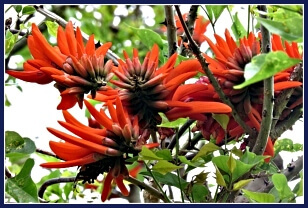 It is unique in that it showcases indigenous plants of southern Africa and those of the Cape Floral Kingdom in particular. Most National Botanical Gardens throughout the world exhibit other countries’ flora. Spending a day at Kirstenbosch at any time of the year will prove to be an extraordinary experience. Twice a day volunteers give an informative 2-3 hour tour of the extensive gardens and anyone who loves gardening will gain a deep appreciation of what has been achieved there over the last century. Afterwards there is a choice of two restaurants to be visited for refreshments, a few shops containing relevant books and quality goods and a nursery offering a wide variety of indigenous plants for purchase. To buy books about Fynbos click here! Other Botanical Gardens in the Western Cape include George, Caledon, Harold Porter (Kogelberg), Stellenbosch University. All have nurseries and can offer planting advice. Most hold Spring and Autumn plant sales. Closer to home is Diepwalle nursery in the Gouna Forest outside Knysna. Then there are online nurseries like Fine bush people who can supply fynbos plants and seeds indigenous to our area. The South African National Biodiversity Institute SANBI) is responsible for exploring, revealing, celebrating and championing biodiversity for the benefit and enjoyment of all of South Africa’s people. Although it occupies only 2% of the world's land area, South Africa is home to nearly 10% of the world's plants and approximately 7% of its reptiles, birds and mammals. This makes South Africa the third most biodiverse country in the world (following Indonesia and Brazil). Information about Plant biomes evolved from a biome project created by Ann and Karl Nelson, two fabulous 6th grade math and science teachers at West Tisbury School on Martha's Vineyard, an island approximately 6 miles off the south coast of Massachusetts. Students researched and produced the information and the site was created and developed by Elisabeth Benders-Hyde. Grootbos Private Nature Reserve where you can experience the transformative power of nature, lose yourself in a botanic wonderland, befriend the ocean's elusive gentle giants, explore the open spaces without and within, celebrate the riches of earth on a plate, enjoy 5 -star comfort in understated luxury and make memories to last a life time. 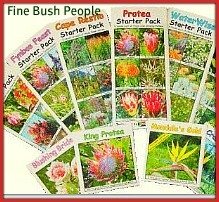 FINE BUSH PEOPLE will send FYNBOS SEEDS to anywhere in the world. The packets contain full growing instructions. CLICK on the picture below to go to their website.